Towering more than 1,000 feet above Thornton Gap, Marys Rock is one of the most popular summits in Virginia’s Shenandoah National Park. Sitting atop the rock’s highest fins offers true 360-degree panoramic views of the Blue Ridge Mountains, Shenandoah Valley, and beyond. Yet the approach is not for the faint of heart: while there are easier and longer ways to the summit, the most dramatic route ascends 1,200 feet from the Panorama parking area at Thornton Gap. Window views through the trees offer picturesque views along the way, helping one to forget the challenging uphill slog. 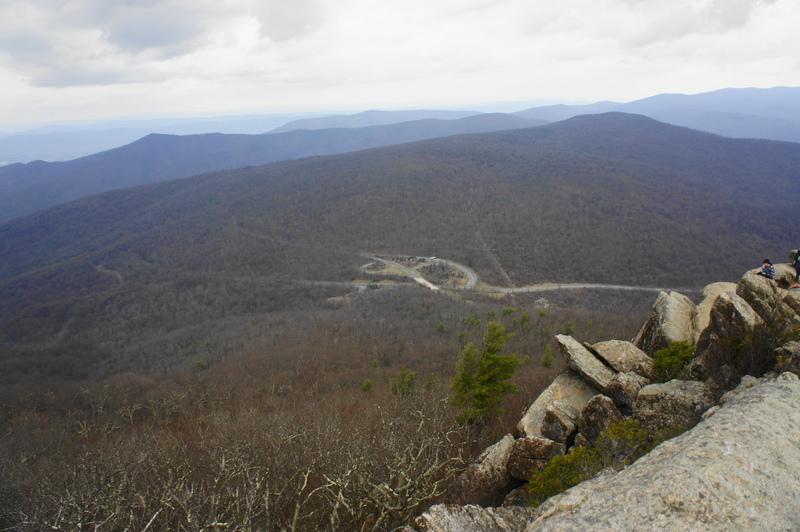 There are three main ways to reach the summit at Marys Rock in central Shenandoah: The first, and longest, option is a very pleasant, 7-mile out-and-back from the Pinnacles parking area. (Note: See the trail description here.) 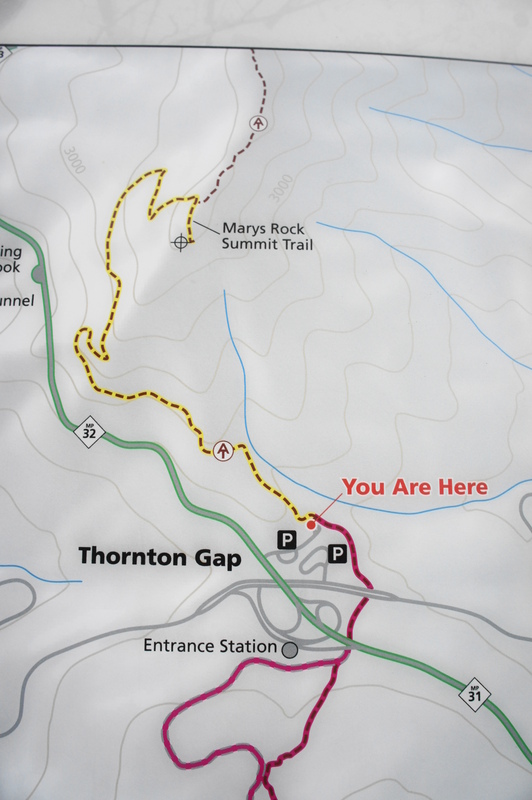 The second route—a 2.6-mile round-trip jaunt from the Meadow Spring Trailhead—is the shortest, albeit with one sharp ascent. Finally, the steepest option is the most dramatic and most easily accessible from Washington, DC: a 3.5-mile out-and-back from the Panorama parking area, situated just south of the Thornton Gap Entrance Station. This is the hike described below. 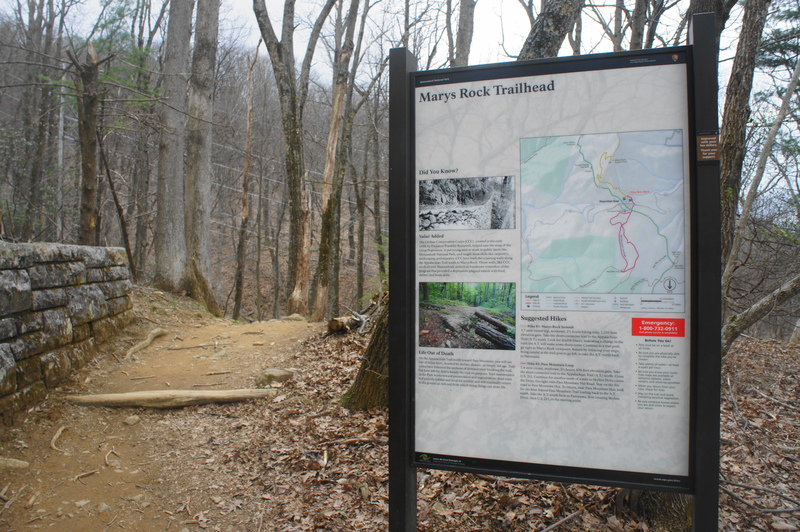 From Panorama, look for the start of the trail to Marys Rock at the far southern end of the parking lot: a tall informational sign provides a brief description and map of the hike, as well as others in the area. The summary calls for 2 ¾ hours to complete the round trip, but many fit hikers can complete the out-and-back in less than two hours, while others who want to take their time climbing—or relaxing at the top—may want to allot at least three hours in total. The wide and well-trodden route begins as a simple connector path, meeting up with the famed Appalachian Trail (AT) after just seconds of walking. Bear left on the AT as it briefly parallels a set of power lines and climbs a dozen wooden stairs—a warm-up for the climbing to come. 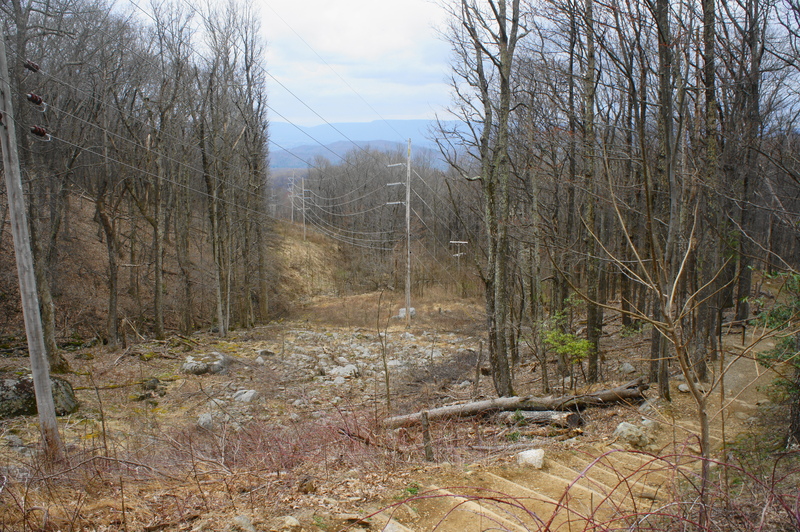 As hikers round the first switchback, they can catch a brief view of distant peaks through the tree cut for the power lines. A minute later, the trail switches back again, to the right. Passing under the power lines, the views improve further. For the next 2/10 mile, the trail traverses a long straightaway but climbs laboriously through one of the hike’s steepest sections. Eventually the trail curves left again around another switchback amid a large rock field, then wraps around a north-facing hillside, offering obscured but lovely views of Thornton Gap and US Route 211 below. 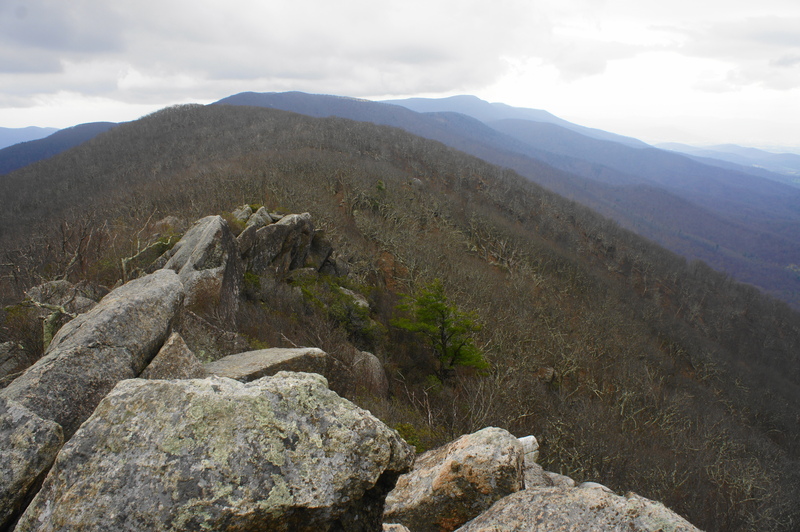 The sloping mounds just across the gap are Pass Mountain (3,052’) and Oventop Mountain (2,468’), situated within the North District of Shenandoah National Park. By now the incline has lessened significantly, and the AT turns southward, with east-facing views into the Thornton River Valley. On the horizon, behind Pass and Oventop Mountains, lie the highest peaks of the North District, including Hogback Mountain (3,474), South and North Marshall (3,212’; 3,368’), and The Peak (3,255’). At ½ mile, the trail passes a slope with moss-laden boulders on the right, followed soon by a lovely pine-laced corridor situated on a perch above a steady drop-off to the left. By now the width of trail has narrowed significantly, and there are few barriers that would halt a tumble off the side—although the path is flat and easy to traverse. Just beyond this section, hikers approach a collection of mammoth-sized rock monoliths on the right. 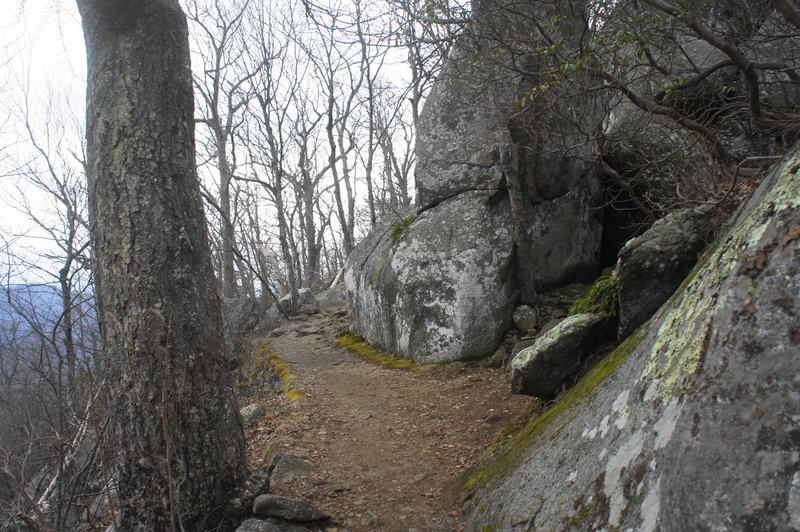 While much of the Blue Ridge Mountains is composed of Catoctin greenstone, a metamorphic rock, the tops of Marys Rock include patches of igneous granite formations. At about 7/10 mile, the incline steepens again. After rounding a corner, one can spot southbound Skyline Drive as it snakes around Marys Rock to the east. At 8/10 mile, the trail abruptly rounds a switchback, followed by another within a couple minutes. Just before the 1-mile mark, a window view through the trees provides another great look toward the Piedmont to the east. Passing more boulder protrusions on the right, the route edges south, bearing ever closer to the top of Marys Rock. After cresting a slope dotted with mountain laurel, the hill reveals itself to be a false summit. 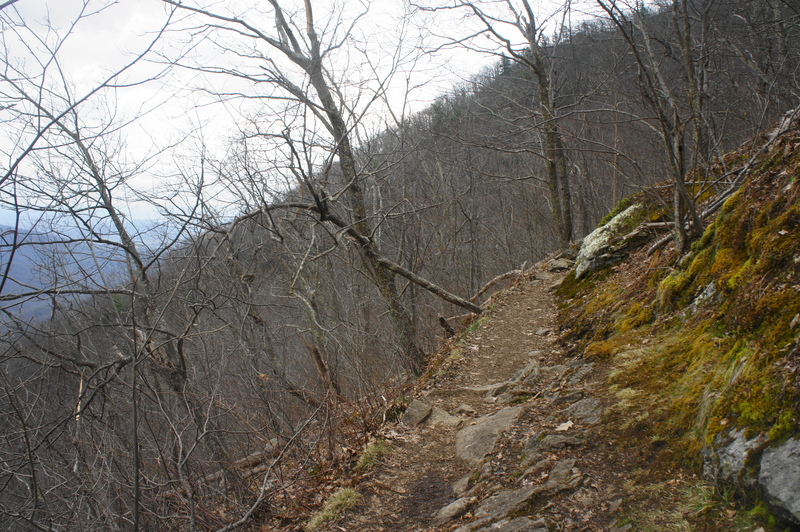 At 1.4 miles, the trail switchbacks to the north, although the ascent is not particularly steep. Moments later, the AT bends back southward, and a “camping prohibited” sign indicates that the end is near. After a final switchback at 1.6 miles, hikers reach a trail junction—the AT continues left (toward Meadow Spring and Pinnacles), while a spur path leaves to the right. This spur is the way to Marys Rock summit. After a final stretch of rocky steps, the trail ends at a spectacular lookout. 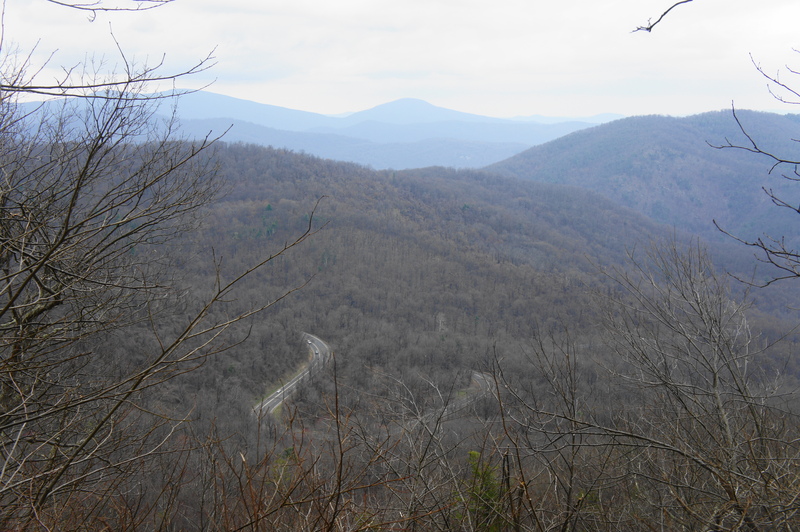 To the north, Thornton Gap and Pass Mountain appear dwarfish from the high overlook, while the Blue Ridge Mountains stretch for miles off into the horizon. Climb the fin at the viewpoint for views to the south: here an even higher point on Marys Rock reveals itself—a short walk, but difficult climb, away. This is the true summit. 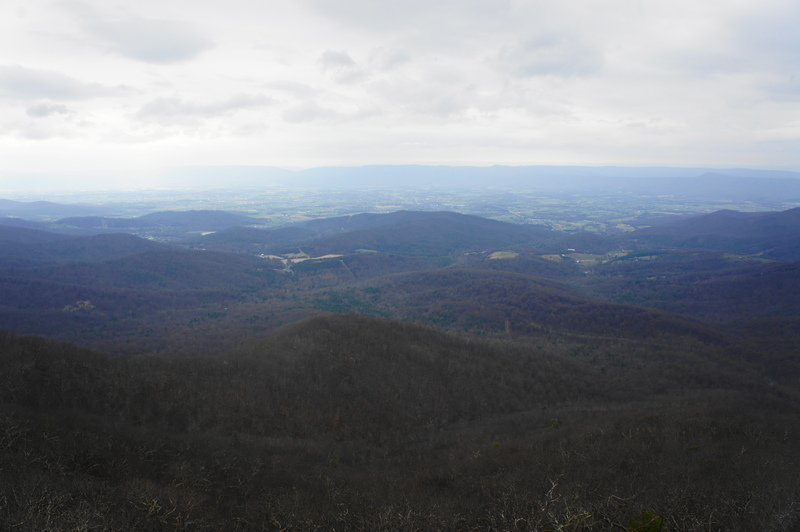 Beyond, one can see a stretch of peaks in Shenandoah’s Central District, from The Pinnacle (3,730’) to Stony Man Mountain (4,011’) to Hawksbill (4,050’). The shadowy, rugged peak to the left of Stony Man is the famed Old Rag Mountain (3,268’). The views to the west and east reveal foothills that give way to a patchwork of farms and fields. The westward vista covers Shenandoah Valley (more precisely, Page Valley), with Massanutten Mountain and Great North Mountain beyond. To the east, the Appalachians come to a gradual end as a long plain leads toward the Potomac and Washington, DC. 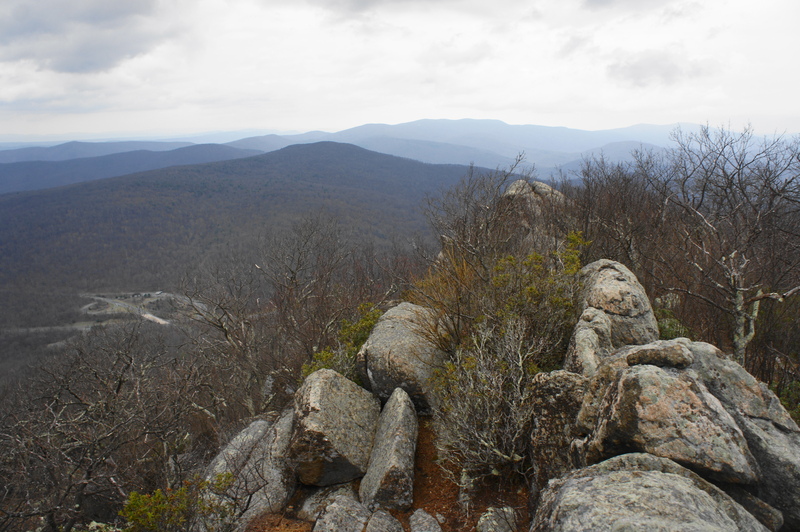 In short, Marys Rock offers one of Shenandoah’s best panoramas, best enjoyed on a relatively cloudless day in the off-season, when the summit’s visitation is lower. Once complete, return the way you came to the Panorama parking area at Thornton Gap. This entry was posted in Moderate Hikes, Shenandoah National Park, Virginia and tagged Appalachian Trail, Marys Rock, Panorama, Shenandoah, Thornton Gap, Virginia. Bookmark the permalink.